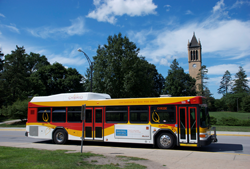 The objective of this project was to evaluate the in-use fuel economy and emission differences between hybrid-electric and conventional transit buses for the Ames, Iowa transit authority, CyRide. These CyRide buses were deployed in the fall of 2010. Fuel economy was compared for the hybrid and control buses. Several older bus types were also available and were included in the analysis. Hybrid buses had the highest fuel economy for all time periods for all bus types. Hybrid buses had a fuel economy that was 11.8 percent higher than control buses overall, 12.2 percent higher than buses with model years 2007 and newer, 23.4 percent higher than model years 2004 through 2006, 10.2 percent higher than model years 1998 through 2003, 38.1 percent higher than model years 1994 through 1997, 36.8 percent higher than model years 1991 through 1993, and 36.8 percent higher for model years pre-1991. On-road emissions were also compared for three of the hybrid buses and two control buses using a portable emissions monitor. On-average, carbon dioxide, carbon monoxide, and hybrid carbon emissions were much higher for the control buses than for the hybrid buses. However, on average nitrogen oxide emissions were higher for the hybrid buses. The tech brief for this project presents an assessment of the costs and benefits of hybrid versus regular transit buses.